THE American Army Pearl Harbor investigation was the only one well and honestly done, with testimony under oath and lawyers and a court reporter in attendance. Click these links for the whole report and its Top Secret Addendum. The Pearl Harbor cover up has been of epic proportions. Website note: International Historic Films has an interesting video on this subject: DECEMBER 7TH: THE MOVIE (Walter Huston) USA, 1942, B&W, 82 minutes. 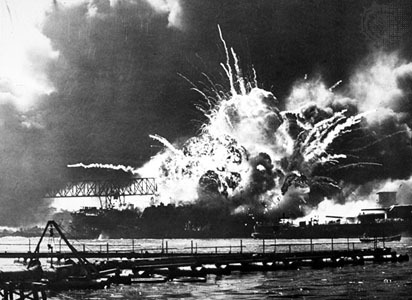 A correspondent writes: "This film depicting the attack on Pearl Harbor was banned by the US Government for nearly 50 years because of its finger-pointing exposure of the Government's faults. It was confiscated as damaging to morale. (A completely censored 34-minute version of the film was released in 1943 and won an Academy Award for Best Documentary Production). Co-directed by John Ford and Greg Toland; music by Alfred Newman; featuring Walter Huston and Henry Davenport. This is the complete and uncut original version."